Rangers midfielder Steven Davis has been rewarded for his fine form by being named player of the month for January in the Scottish Premier League. The 25-year-old received his Clydesdale Bank award after scoring twice during a month that Rangers ended unbeaten in seven league and cup games. 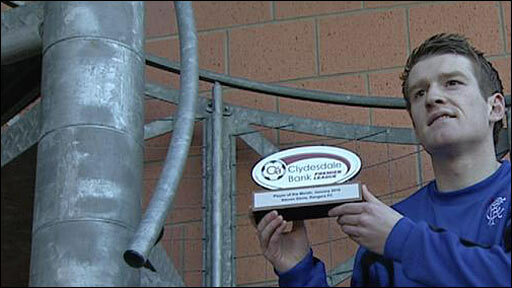 And he added to his goal tally in last week's Co-operative Insurance Cup semi-final win over St Johnstone. Davis was last season nominated for the PFA Scotland player of the year award. After joining Rangers on loan from Fulham in January 2008, Davis completed a permanent move to Ibrox later that year and was an important part of Walter Smith's side as they completed a league and cup double last season. The Northern Ireland international has spent much of his Rangers career playing wide on the right. However, the absence of Pedro Mendes this season has seen Davis play in a more central role, with Mendes injured for much of the season before moving to Sporting Lisbon in January. Rangers manager Walter Smith was full of praise for the midfielder, saying: "It's a thoroughly deserved award. "I've said on a couple of occasions that in games over the past month he has been exceptional for us - not only in terms of overall play but also the number of goals he is getting for us. "We lost Kris Boyd and Kenny Miller, which is always awkward for any team to lose their front two players, but Steven has helped us with that as well. "For his performances and goals, I think it's a deserved award."